Which MLB Team Helped Its World Series Chances The Most At The Deadline? This year saw just about the best you can hope for from baseball's trade deadline: huge deals, sweeping misinformation, an old man setting his laptop on fire. But how much has the landscape actually changed? Baseball Prospectus examined how World Series odds changed for MLB teams before and after the trade deadline. Did ESPN Get Fooled By A Fake Twitter Account Reporting A Zobrist Trade? The A's saw the biggest jump as their odds of winning the World Series jumped 1.1 percent after acquiring Jon Lester and Jonny Gomes for Yoenis Cespedes. But the A's will not have an easy road to November. They'll likely have to play the Tigers, whose odds increased 0.5 percent after obtaining David Price, the second largest increase among MLB teams. The full Baseball Prospectus chart can be found here. BP generated the odds by simply resetting the depth charts for each team, then running its PECOTA simulation for the rest of the season. The Blue Jays saw the biggest decline, a drop of 1.4 percent. Though this is likely due to trades or that several players (Brett Lawrie, Adam Lind, and Edwin Encarnacion) remain injured, which would also affect simulations, and it's unlikely that trades like getting Danny Valencia for Liam Hendriks and Erik Kratz could have that much impact alone. FanGraphs ran a similar study. There, the A's didn't crack the top 5 in championship odds. Instead, they found the Tigers (+2 percent) and Dodgers (+0.8 percent) World Series odds increased most. And the Nationals (-0.9 percent) and Indians (-0.6 percent) odds declined most. On the betting end, the A's odds of winning the World Series rose from 5/1 to 4/1, according to Bovada. 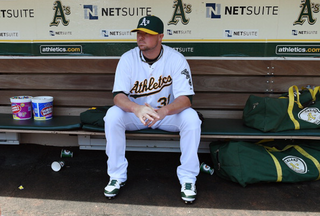 Oakland had the best odds of winning the Series both before and after the trade deadline. The Tigers and Dodgers similarly jumped from 6/1 to 5/1 both tying for second.